Cosplay Costumes and Accessories for Sale Here! Itachi is a ninja character who is a wanted criminal and murderer, despite the fact that he does not show enjoyment in violence. His partner is Kisame Hoshigaki. He joined a group called Akatsuki after massacring the Uchiha. He spares his little brother though who will one day surpass his strength, techniques and movements. He usually attacks only in defense and remains stationary as he likes to avoid battle altogether. He uses his Sharingan eyes to assess an opponent's movements and actions and respond accordingly. His Red Eyes can trap other victims within an illusion by merely looking at them. How to look like Itachi? With the itachi red contact lenses, now anyone can look like this amazing character. This is a perfect lens to finish off any Halloween costume. 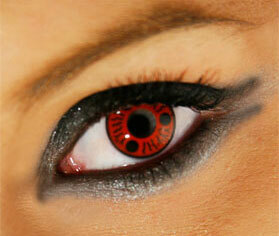 These are also known as Sharingan Contact lenses or Itachi contact lenses. Naruto Accessories. Please note there is a 7-10 day delay on these if ordering from USA as they are getting shipped form Australia. Want to look like a wanted ninja known as Itachi? You can definitely do so with Coco Contact’s Wild Itachi / Sharingan lenses. Perfect for cosplays or simply just to excite your friends. Give yourself an anime makeover and purchase a pair now here at cococontacts.com. • These lenses ARE soft contact lens.